A trip to the dentist can be stressful for most people. A trip to the dentist for a child is something that takes careful planning – until they get used to it at least. With my eldest child this meant watching a YouTube episode of Tots TV – the one where they go to the dentist – as well as observing mummy’s teeth being scrutinised by our lovely dentist before her turn to sit in the chair. ” It’s very dirty inside mummy’s mouth” being the only observation my 5 year old made – and I was in no position to argue, mouth wide open, mid-scale and polish. And, a trip to the dentist for a child with additional needs can be a different experience altogether. Powers of reasoning are nil or virtually non-existent. The best that can be hoped for, on the first few visits, is that the child gets used to the clinic. Actually, this is the easy part, Hazel loves visiting clinics and hospitals. She hasn’t had much choice in the matter and often comes away with more than she went in – usually a teddy or a toy if it’s been particularly traumatic, a sticker if less so. Then there’s the chair, the shiny bright light and the dentist. Oh and the dental nurse. However friendly they may be, it’s still an enormous ask for Hazel to let them anywhere near her mouth. As a child who is 100% tube fed, Hazel has more reasons than most not to open her mouth. Oral feeding is a huge challenge for her and us, and, although we believe she will learn to eat eventually, it’s one step at a time. Hazel knows all too well that if something is supposed to go in her mouth (i.e. food, drink or a toothbrush) then it is to be avoided at all costs! Paint, glue or sand, however, can be consumed in vast quantities. At least, that’s what Hazel thinks. When it comes to feeding, or in this case a dental examination, you may smile all you like at her, play peekaboo or whatever. She ain’t going to open wide for anyone! All credit to the dental team we saw. Not our family dentist, but an NHS clinic that specialises in treating patients with additional needs. And boy, did their training pay off! It started well. Smiles and “hellos” all round from Hazel to everyone and anyone in the waiting room – as well as to the staff standing in doorways as she trundled along in her wheelchair to the examination room. The dentist and her nurse got the joy treatment too. The dentist and Hazel soon made friends….the inflated surgical glove trick was hilarious. No amount of “tickle-tickle” or “look at the pretty light” would cut it. Hazel shut up shop. Jaws clamped together. Prising them open? A foolish notion that was never going to be an option. I valued my fingers as did the dentist. We changed position. Taking Hazel out of her wheelchair and sitting her on my lap as I lay back in the dreaded chair. Hazel relaxed a little, presumably thinking her ordeal was over and we were merely getting comfortable. She began to “chatter” in her own way. Not many recognisable words to the untrained ear but I knew it was a song she loved. Her most favourite song in the world. Ever. Mesmerised by their harmonious singing. The dentist saw all she needed to. Though I confess I felt a little stab of guilt that it wasn’t actually Hazel’s birthday and that I might just be adding to her confusion by using the song out of context. However, the end justified the means. Advice and Disney sticker dispensed and we were on our way. The dentist recording in her notes that Happy Birthday might well do the trick again next time. And, as we left, the dentist and her nurse told us they’d had a challenging day in the land of special needs dentistry, but that Hazel had been a delight to finish it with. Smiles all round. Just another day in the life of our family and not without its challenges as she has been unwell but Hazel still manages to throw a little joy bomb* into the lives of the people she meets. *Joy bomb – a term I have unashamedly stolen from another mum of a child with DS. If ever there was an expression to sum Hazel up it’s this one! 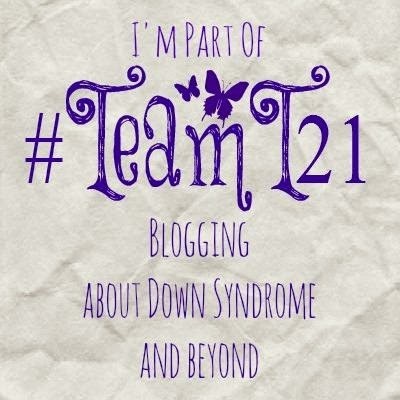 Categories: Down Syndrome, Down's Syndrome, Joy, Trisomy 21 | Tags: #additonalneeds, #dentist, #downsyndrome, #nhs, #Team 21, #Trisomy21, joy | Permalink. Wow, I’ve never heard of a specially trained SEN dentist! Are they all over the country? Not sure, ours come under our Local Offer, so it’s quite possible. I have a son who has Down syndrome and HATES the dentist, perhaps we’ll try Happy Birthday the next time he goes, lol!